4 October - Very little to report since my last entry. 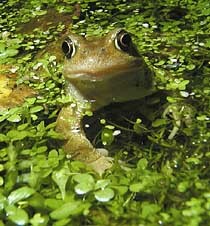 The frogs continue to be the main focus of interest as they patrol the sides of the pond. This one was pictured at 9pm tonight. I have seen a number of very small individuals in the plant growth around the ponds so I am reluctant to do too much clearing at the moment. Over the last few days I have seen several large dragonflies pass over the garden but I haven't seen any of them come down to the pond.